Below you fill find all funeral homes and cemeteries in or near Skowhegan. Zip codes in the city: 04976. Somerset County funeral flowers can be purchased from one of the local funeral shops we partner with. Some of the notable people born here have been: (margaret chase smith), (rodney whittemore), (stephen coburn), (abner coburn), and (kenneth p. macleod). Skowhegan /skaʊˈhiːɡən/ is the county seat of Somerset County, Maine, United States. 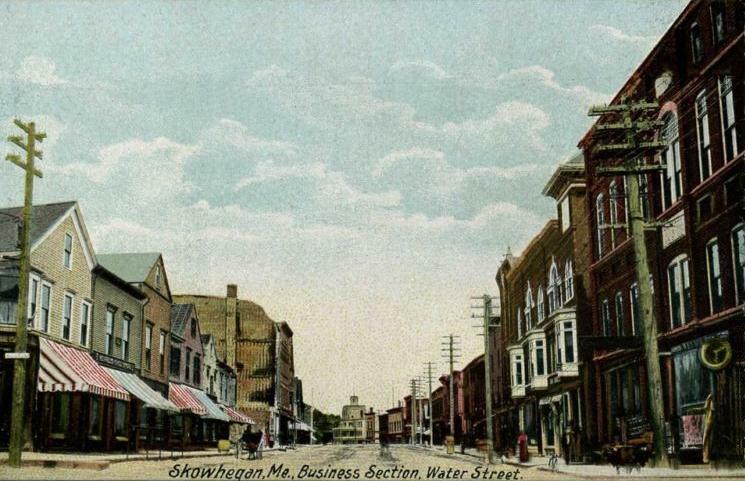 Skowhegan was originally inhabited by Abenaki Indians who named the area Skowhegan, meaning "watching place [for fish]." The native population was massacred or driven from the area during the 4th Anglo-Abenaki War. As of the 2010 census, the town population was 8,589. Skowhegan School of Painting and Sculpture is an internationally known residency program for artists, though it is technically located in neighboring East Madison. Every August, Skowhegan hosts the annual Skowhegan State Fair, the oldest continuous state fair in the United States. It was revealed by Baker City Herald on March 16th, 2018 that James A "Jim" Kenney passed away in Baker City, Oregon. Kenney was 64 years old and was born in Skowhegan, ME. Send flowers to express your sympathy and honor James A "Jim"'s life. It was noted on February 10th, 2018 that Madelyn Krause (Colligan) died in Skowhegan, Maine. Ms. Krause was 93 years old. Send flowers to express your sympathy and honor Madelyn's life. It was disclosed on January 18th, 2018 that Mary Rachael Stevens (Wentworth) died in Palm Harbor, Florida. Ms. Stevens was 82 years old and was born in Skowhegan, ME. Send flowers to express your sorrow and honor Mary Rachael's life. It was written by San Antonio Express News on December 10th, 2017 that Michael Damon Baker died in San Antonio, Texas. Send flowers to express your sorrow and honor Michael Damon's life. It was disclosed by Providence Journal on June 9th, 2017 that Darryl David Stickney perished in Cranston, Rhode Island. Stickney was 74 years old and was born in Skowhegan, ME. Send flowers to express your sympathy and honor Darryl David's life. It was revealed on March 10th, 2015 that George Poulin passed on in Altamonte Springs, Florida. Poulin was 80 years old and was born in Skowhegan, ME. Send flowers to express your sympathy and honor George's life. It was disclosed by Sarasota Herald-Tribune on August 29th, 2014 that James Warren Clark passed on in Sarasota, Florida. Clark was 56 years old and was born in Skowhegan, ME. Send flowers to express your sympathy and honor James Warren's life. It was revealed by Salem Evening News on April 11th, 2014 that Verly D Simpson (Gagnon) perished in Peabody, Massachusetts. Ms. Simpson was 85 years old and was born in Skowhegan, ME. Send flowers to share your condolences and honor Verly D's life. It was noted on March 6th, 2014 that Winifred Lillian Williams (Lockwood) passed away in Skowhegan, Maine. Ms. Williams was 66 years old and was born in Norwich, CT. Send flowers to express your sympathy and honor Winifred Lillian's life. It was reported by Norwich Bulletin on May 1st, 2013 that Lorraine Johnson (Pomelow) passed away in Norwich, Connecticut. Ms. Johnson was 86 years old and was born in Skowhegan, ME. Send flowers to share your condolences and honor Lorraine's life. The Somerset and Kennebec Railroad (later part of the Maine Central Railroad) reached the town in 1856. As of the United States Census, 2000 census, the town population was 8,824. The New Balance Balance Athletic Shoe Company operates a factory in the community. In 1861, the town annexed Bloomfield across the river. Among the town's features is the Swinging Bridge, a suspension footbridge first constructed in 1883 to connect Skowhegan Island with the south side of the Kennebec River. Smart & Edwards Funeral Home, Skowhegan, ME : Reviews and maps - Yahoo! Local, 207.474.3357. Get Ratings, Reviews, Photos and more on Yahoo! Local. Listing all funeral homes in Skowhegan, Maine so you can easily send flowers to any location (same day delivery) or find any funeral service. Funeral Homes found in the State of Maine. Directory of Funeral Homes in Skowhegan, Maine. Find websites related to Funeral Homes in Skowhegan, Maine. We work with local florists and flower shops to offer same day delivery. You will find budget sympathy flowers in Skowhegan here. Our funeral flowers are cheap in price but not in value.